Embarkation and check-in from 2 p.m. in Amsterdam. 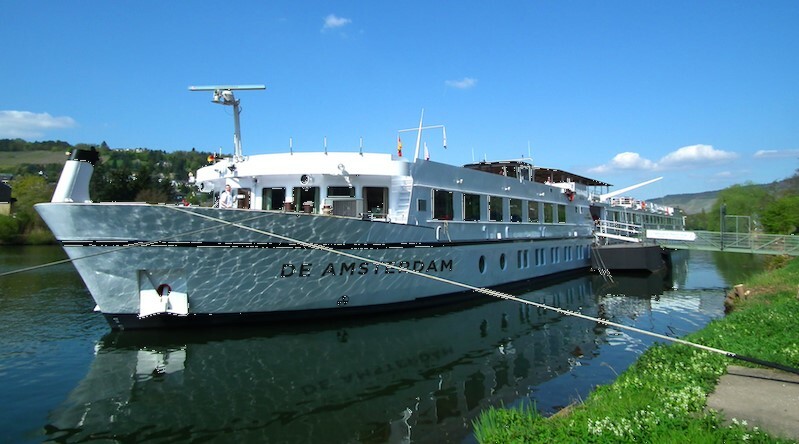 Take the opportunity to go shopping, to explore downtown Amsterdam, take a canal cruise or visit a museum. Welcome drink, dinner and first briefing on board. Your first cycling tour starts in Breukelen. 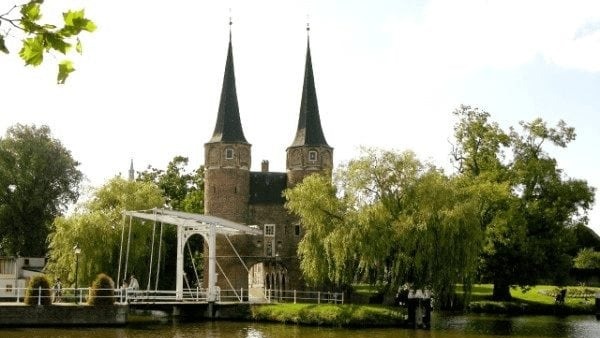 You’ll tour along the beautiful and winding river Vecht with its enchanting background of imposing castles, country houses and quaint tearooms. 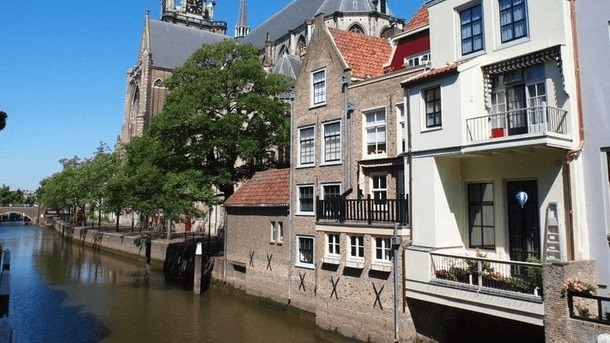 You will follow the Vecht into the centre of Utrecht where you will have the opportunity to explore the beautiful historical city centre: the Dom Cathedral with its tower, the canals, special shops and nice cafes. 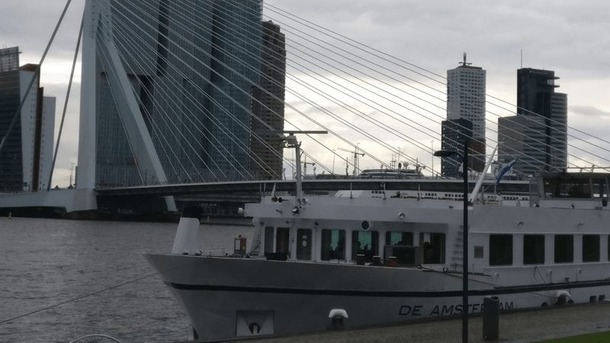 In the afternoon you will continue on by ship from Utrecht to Rotterdam. Today you can cycle the first part or the “waterbus” will take you and your bicycle to Alblasserdam. 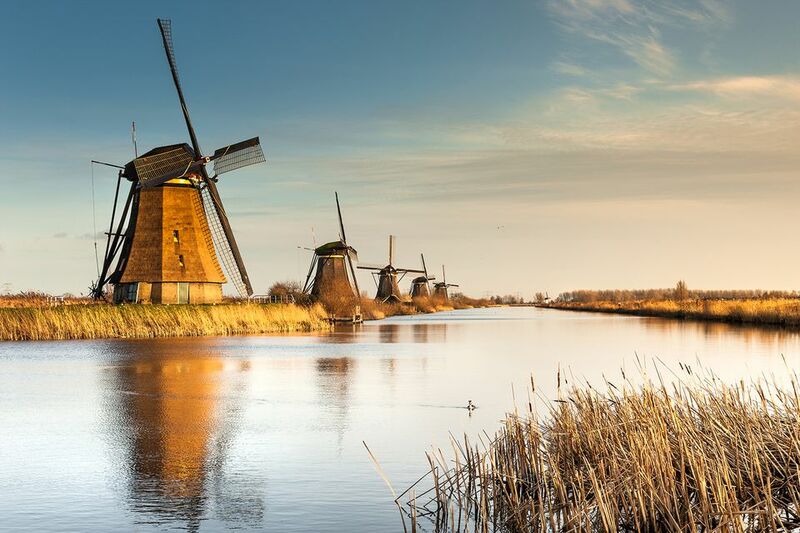 After just a few minutes of cycling you will reach Kinderdijk (UNESCO cultural heritage, with its impressive row of 19 large windmills). 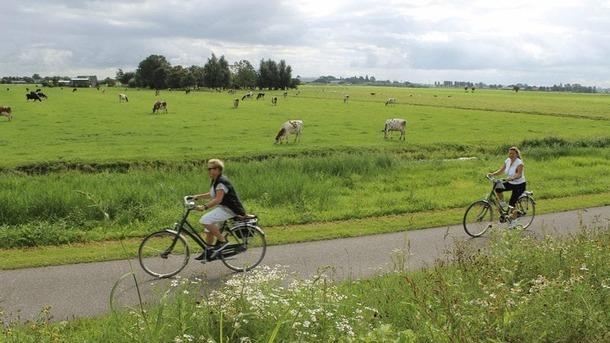 You then have the choice between a longer cycling tour with a visit to the beautiful cheese city of Gouda or a short cycling tour through the Alblasserwaard. Both tours end in the “silver city” of Schoonhoven, where you can visit a silversmith. 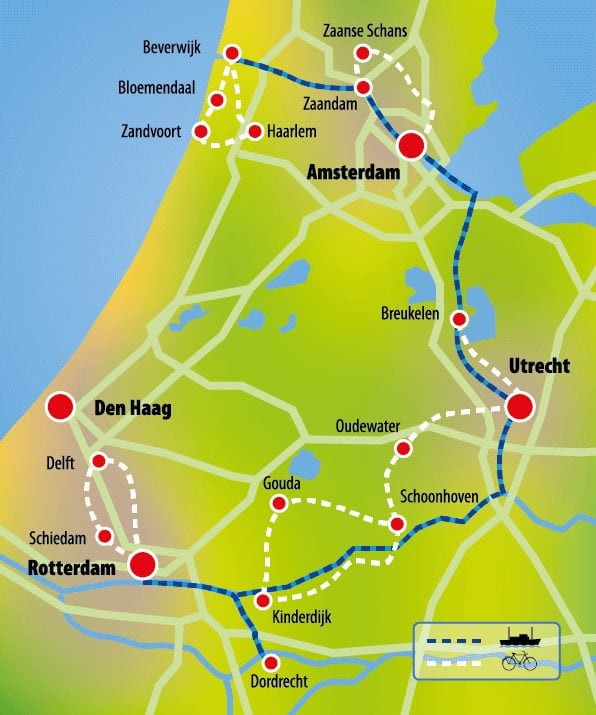 Today you will cycle from Schoonhoven through the beautiful “Green Heart” of Holland along small villages and quiet roads to Utrecht. On your way you can visit a traditional cheese farm and in Oudewater you can visit the Witches Weigh House. Late afternoon the ship will sail from Utrecht to Haarlem. *Departure dates between April 14 and May 5: On Thursday you have the opportunity to visit the world famous Tulip exhibition park “Keukenhof” in Lisse (by bicycle or public transport; transfers/tickets/entrance fees not included). 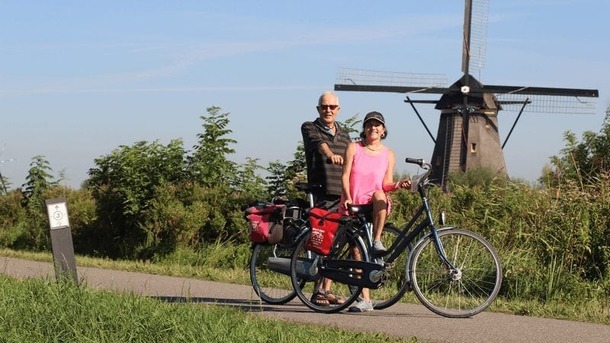 From Zaandam your final day of cycling will take you to the open air museum the Zaanse Schans (free entry), with its beautiful windmills, an Old Dutch village with traditional wooden houses, a cheese farm and a traditional wooden clog maker. 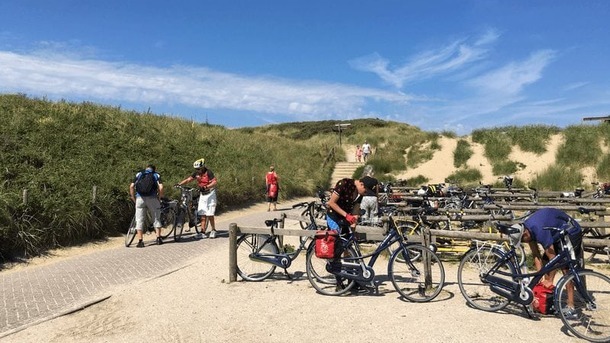 After exploring the museum you cycle through the recreational area “Twiske” back to Amsterdam. The afternoon and evening are yours to enjoy everything Amsterdam has to offer. If you didn’t do a canal tour on the first day, you will have the opportunity to do so today. 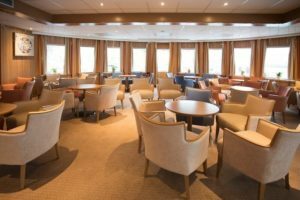 The Amsterdam has a spacious restaurant on the lower deck. 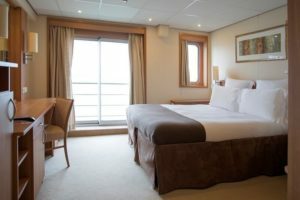 The pleasant lounge on the upper deck has large windows around, which offers you a great view of the surroundings. There is also a bar with a dance floor. Wi-Fi is available. On the partially roofed sun deck, chairs and sun loungers invite for a stay. 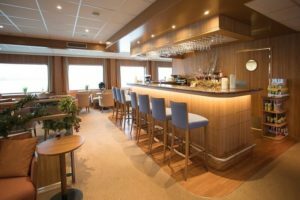 Here you can relax and have a drink and enjoy the scenery while sailing. 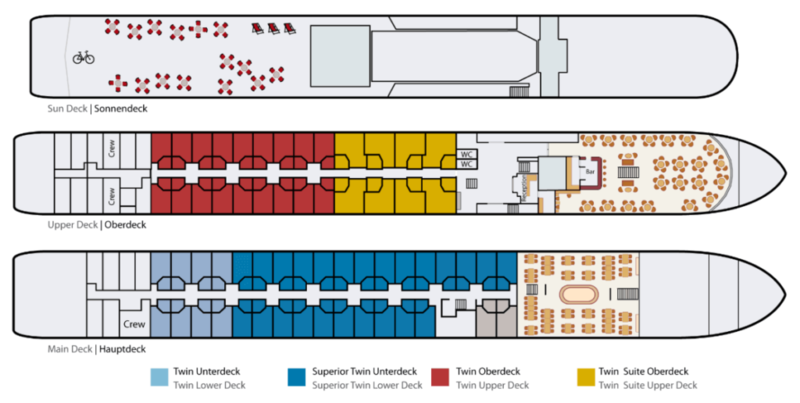 Bicycles will be stored on a separate part of the sun deck. 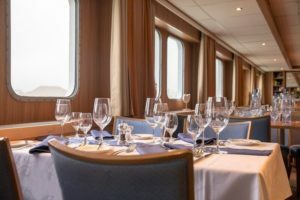 Catering: A spacious restaurant on the lower deck. In the morning the oval buffet in the middle. 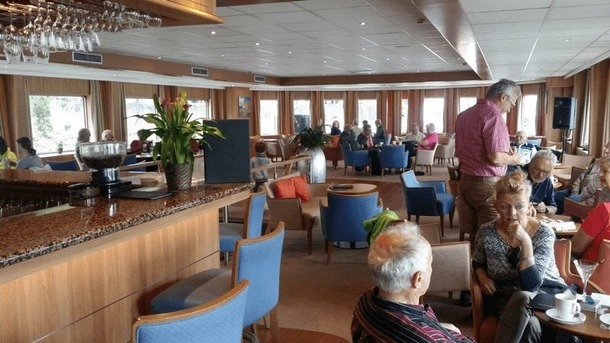 The pleasant lounge on the upper deck has large windows allround which offers you a great view of the surroundings. There is also a bar with a dance floor for some evening fun! on one of these dates, you can add the “fully guided” option (limited availability). * City hall Zaandam and more. it is possible to cover longer distances during the night. the day for extending the cycling program.